We may change these Terms of Website Use by our discretion. We will do so by posting revised Terms of Website Use on this Website. The date of the version of these Terms of Website Use is stated at the top of the page. Please review the Terms of Website Use periodically. Your continued use of this Website following the posting of changes to these Terms of Website Use will mean you accept those changes. We recommend that you print a copy of these Terms of Website Use for your records. The materials on this Website as well as its layout, organization and design are copyrighted and are protected by under Copyright Act (R.S.C., 1985, c.C-42). Material from this Website (“Materials”) may not be copied, distributed, or republished in any way, without the prior written consent of SURA Korean Royal Cuisine Restaurant Vancouver, except you may display on your computer, download and print the contents of this Website for your personal or educational, non-commercial internal use provided that you attribute ownership of such content to SURA Korean Royal Cuisine Restaurant Vancouver. Modification or use of Materials for any other purpose violates copyright, trademark and other laws. Except as otherwise described, all Materials on this Website are made available only to provide information. Neither title nor intellectual property rights are transferred to you by your use or download of Materials from this Website and shall remain with SURA Korean Royal Cuisine Restaurant Vancouver who own full and complete title to all Materials on this Website. SURA Korean Royal Cuisine Restaurant Vancouver controls this Website from its headquarters in Vancouver, B.C., Canada and makes no representation that these Materials are appropriate or available for use in other locations. If you use this Website from other locations, you are responsible for compliance with applicable local laws. As a condition of your use of this Website, you agree that you will not use this Website for any purpose that is unlawful or prohibited by these Terms of Website Use. You acknowledge and agree that the performance of this Website and all content or services accessed from or available thereon are provided to you on an as is basis, without representations, warranties or conditions of any kind (to the fullest extent permissible under applicable law), including any implied warranties or conditions, or warranties or conditions of merchantability, accuracy, validity, reliability, fitness for a particular purpose or non-infringement of the rights of third parties. We make no representation or warranty to you, whether expressed or implied, that our Website and any content or services accessed from or available thereon will be uninterrupted, error free or corrected in the event of discovery of any errors, free of viruses or other harmful components, nor for any breach of security or any damage to your computer system or loss of data that may result from accessing, downloading, or using any materials from our Website. By visiting this Website, you agree that to the maximum extent permitted by law, in no event shall SURA Korean Royal Cuisine Restaurant Vancouver or its officers, employees or agents be liable for any damages based on claims arising out of or in any way connected with the use of this Website, whether such damages are direct, indirect, punitive, incidental, special or consequential, and even if SURA Korean Royal Cuisine Restaurant Vancouver has been advised of the possibility of such damages or ought to have known of the possibility of such damages. For your convenience, this Website may contain links to other websites which are not operated or controlled by SURA Korean Royal Cuisine Restaurant Vancouver (“Other Sites”) that may be of interest to you. 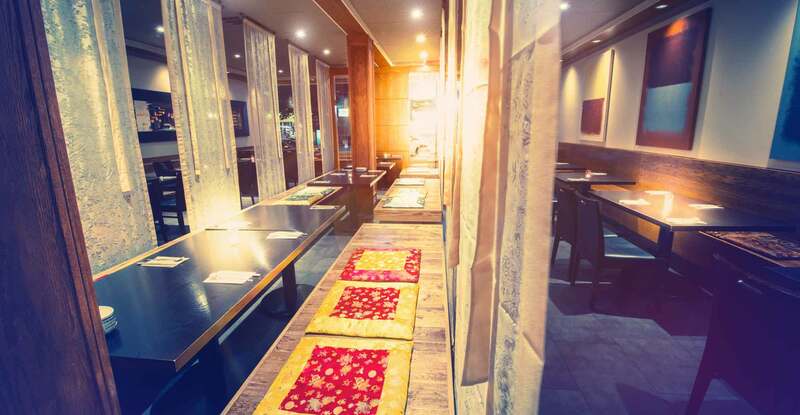 SURA Korean Royal Cuisine Restaurant Vancouver assumes no responsibility for the Other Sites, their business, goods, services or content (including content obtained through links on the Other Sites) and your use of the Other Sites is at your own risk. SURA Korean Royal Cuisine Restaurant Vancouver reserves the right to terminate any link or linking program at any time. The inclusion of any link to the Other Sites does not constitute or imply an endorsement, authorization, sponsorship or affiliation by SURA Korean Royal Cuisine Restaurant Vancouver of the Other Sites, or any products or services provided by such Other Sites. Nothing contained herein shall be construed as conferring, by estoppel, implication or otherwise, any license or right in respect of any trade-mark or other intellectual property right of SURA Korean Royal Cuisine Restaurant Vancouver. SURA Korean Royal Cuisine Restaurant Vancouver name and logos displayed throughout this Website and all related products and service names are the trade-names, trade-marks, service marks or registered trade-marks of SURA Korean Royal Cuisine Restaurant Vancouver and are licensed by SURA Korean Royal Cuisine Restaurant Vancouver. Any reproduction of any of these marks, names or logos without the express written consent of SURA Korean Royal Cuisine Restaurant Vancouver is strictly prohibited. All other trade-marks are the property of their respective trade-mark owners. If you breach any of these Terms of Website Use, you may no longer use this Website. SURA Korean Royal Cuisine Restaurant Vancouver may, in its sole discretion, cancel or terminate your right to use this Website, or any part of this Website, at any time without notice. In the event of termination, you are no longer authorized to access this Website or the part of this Website affected by such cancellation or termination. In such event, the restrictions which these Terms of Website Use impose on you with respect to this Website shall still apply. SURA Korean Royal Cuisine Restaurant Vancouver is not liable to any party for such damages arising from such a termination. This Agreement is governed by and is to be interpreted in accordance with the laws of the Province of British Columbia and the laws of Canada applicable in British Columbia. The parties expressly request and require that these Terms of Website Use and any related documents be drawn up solely in the English language. Copyright © 2015-2019 SURA Korean Royal Cuisine All rights reserved.